Give a man Ubuntu, and he'll learn Ubuntu. Give a man SUSE, and he'll learn SUSE. But give a man Slackware, and he'll learn Linux. Well, so the old internet maxim goes, but while it's normally used with a touch of humour, there's a great deal of truth in it too. Slackware is a curious animal, minding its own business while other distros roam the popularity plain and strive for dominance among their peers. It's not trying to win enormous desktop market share, nor is it loaded with blinking lights, hold-your-hand graphical wizards and package managers that change with every release. Slackware is about as pure a GNU/Linux system as you can get – at least, without all the arduous leg work of Linux From Scratch. It's almost entirely developed by one man. The packages are not patched to the hilt. It's comfortable in its own distrosphere. It's very, very, very stable. Let's look at these in more detail. For most of its history, since the first release in 1993, Slackware has been largely the work of one developer: California-based 42-year-old Patrick Volkerding. Pat had some assistance from other paid developers in the distro's earlier days, but now he's a one-man band – albeit with the help of bug reports and patches from the community – and uses sales of Slackware boxed sets to fund his work on the distro. An affable chap with a quirky sense of humour, Pat's down-to-earth geekness puts many long-time Linuxers at ease. Got a question? Try Pat. Got a suggestion? Try Pat. Want to file a bug report? Try Pat. Don't worry about mailing lists, project leaders and Bugzilla accounts – Pat's your man. Indeed, he's known as The Man in Slackware circles. With Pat's central role in Slackware firmly established, we come on to patches. Most distros take the original, upstream source code of a program and weld on patches – one, two, 10, often more – to fit it in with the rest of the software and distro. That's fine for many users, but if you want to be sure you're getting what the developer originally intended, you're better off with Slackware. Now that's not to say that Pat is a patchophobe – some programs are tweaked in places – but by and large the software is left untouched and you don't feel like you're getting a distorted version of the original. There's another side of package purity to consider as well. Contrary to what a lot of armchair distro-pundits may have you believe, Slackware does have a package management system. It's just based around very simple tarballs (.tgz files) rather than the dependency tangled, database-backed systems of RPMs and Debs. The upshot of this is that Slackware packages are extremely easy to pop open, fiddle around in and put back together. Slackware's stringent focus on simplicity has led to a few software casualties in its history, most notably Gnome. In 2005, Pat decided that the work of building and integrating the vast mixture of Gnome packages and their dependencies was just too much. He said: "Please do not incorrectly interpret any of this as a slight against Gnome itself, which (although it does usually need to be fixed and polished beyond the way it ships from upstream more so than, say, KDE or Xfce) is a decent desktop choice." This kicked other developers into action, with the Dropline Gnome add-on desktop project starting shortly after the announcement. It's a great implementation of Gnome, but the message was clear: if you want your software to be included with Slackware, make sure that it's neatly contained and not a nightmare to build and distribute. This brings us to our third point: Slackware has steadfastly remained a non-newbie distro. It's not hard to use – far from it – but it doesn't have a graphical installer or step-by-step wizards to automate every aspect of usage and installation. Slackware users are expected to have a fair grounding in the command line and editing configuration files, which returns us to the maxim at the start: if you decide to use Slackware, you aren't shielded from the workings of Linux under the GUI. You get to learn the underpinnings of Linux, and because the distro doesn't have a huge number of customisations and patches to its software, you don't end up with countless distro-specific config files in guessing-game locations. If you learn the ins and outs of, say, Fedora, you'll be a Fedora guru (which is great). If you learn the workings of Slackware, you'll pick up knowledge that's transferable across many distros. Finally, let's look at Slackware's stability. Without the colossal developer base of Debian, you'd think Slackware would be more prone to problems, but that's not the case. 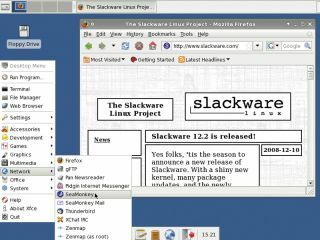 Pat is generally conservative when it comes to integrating new software: the Slackware 12.2 release, for instance, arrived in October 2008 with KDE 3.5, even though KDE 4.1 had been released three months earlier. Having one man at the helm provides a stability boost too. Multiple teams and developers can lead to a discrepancy between the quality of patches, whereas Pat builds the whole lot before a release and therefore maintains a wide but hands-on view of the distro. Sure, big distros such as Debian need large teams and in that context the approach works well, but for Slackware the 'one man doing it all' approach has done an equally good job. So there we go. That's Slackware. It's not the newbie's best friend, but it's still a much-loved distro after 15 years and no intermediate-or-above Linux user should go without trying it at least once. Just be aware of one other snippet of wisdom from Slackware circles: "Once you go Slack, you'll never go back."